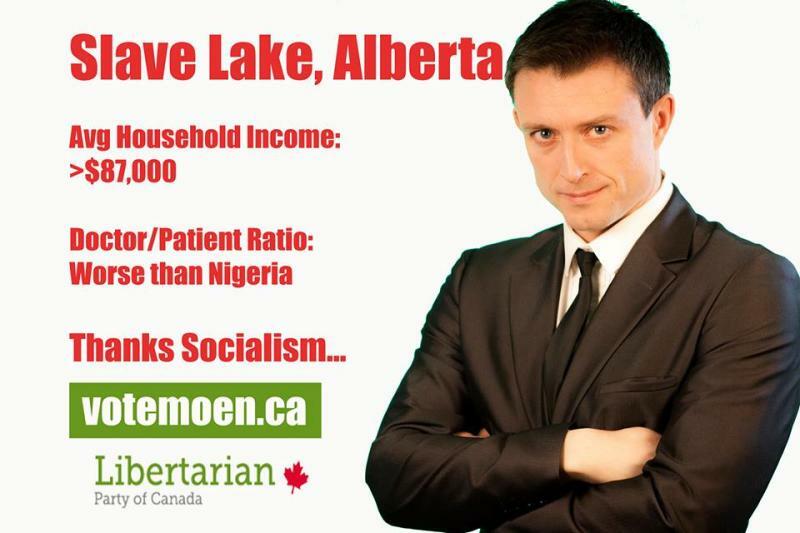 If elections were won based on creativity, then this guy would be the next MP for Fort McMurray - Athabasca. 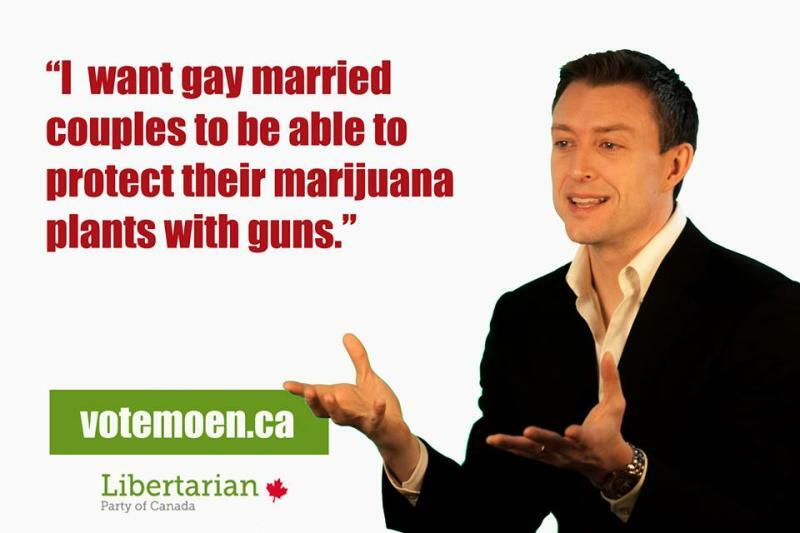 Libertarian candidate Tim Moen — who is running in a federal byelection which has yet to be called — is getting a lot of attention for his social media memes which explain Libertarian-ism. Here's a sampling of some of them. The memes have now been featured on CNN, the Huffington Post and on Reason.com. In an interview with Yahoo Canada News, on Thursday, Moen talked about his platform. "A Libertarian is someone who espouses the philosophies of classical liberalism -- the idea that a person owns himself and is a product of his or her labour and that people ought not initiate force against other people to try and get their way," he said. He continued, explaining how a Libertarian government might tackle taxes. "We see taxes as an initiation of force because the end-product of not paying your taxes or not complying is that you get thrown in the jail. And we don't think that people have the right to demand money or else you'll be thrown in a cage," Moen, firefighter by day, said. "We're against that type of funding for social goods. We understand that there are things that people want. There are roads and healthcare and maybe national defence...so we're for finding ways of connecting people with those services that don't involve initiating force." He suggests that a flat tax might be a good compromise. 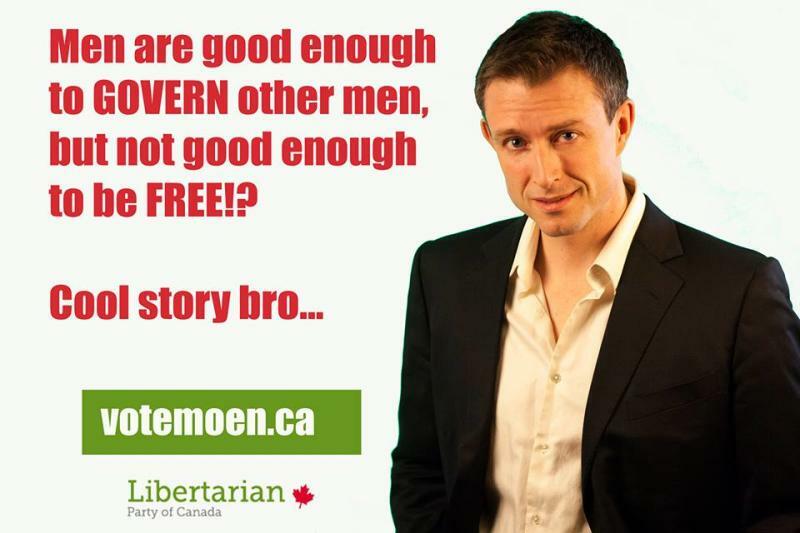 As for the memes, Moen says that they're really helping him get out his message. "It's a message people get and it kind of highlights the Libertarian perspective very succinctly and kind of in a way that grabs people's attention," he said. But Moen and his party face an uphill battle. In the 2011 election, the Libertarian Party of Canada earned only 6,002 votes nationally. To put that into perspective, the Marxist-Leninist Party of Canada earned 9,925 votes and the Pirate Party received 3,197. You can checkout Moen's website here.